This route leads mostly through the Gauja National Park, which features the most beautiful river valley in the Baltic States - the ancient Gauja River Valley with its faune, its flora, and the mightiest Devonian era sandstone cliffs in the Baltic States. While riding the route, you can study Latvia's most brilliant medieval town, Cēsis. You can visit medieval castles and castle riuns there and in Sigulda. A guide will take you through underground bunkers in Līgatne which were secret in soviet times and have no analogue in North-eastern Europe. You'll see the unique Soviet-style town of Seda and learn about the traditions of rafters at Strenči. Get off your bike and canoe down the Gauja for a separate adventure. You will never forget the landscapes that you will see, and you will be inspired by the untouched nature is all around you. Additional: Transfer to the hotel. Pick up the info package with maps and the detailed itinerary. Pick up the bicycles at the hotel. Cycling: Strenci - Valmiera (~33 km, 70% tarmac, 30% gravel road). En route: town Strenči and brewary Brenguli with beer garden. In Valmiera: the Valmiermuiža brewery, the Regional Research Museum, the castle ruines, St. Simon`s Lutheran church, the ruins of the Riga gate. To see more photos from this day please click here. Cycling: Valmiera - Cesis (~55 km, 5% tarmac, 10% gravel road, 85% forest trails). En route sightseeing of Sietiņiezis white sandstone cliffs and Erglu red sandstone cliffs by the river Gauja. Free time in Cesis. Attractions include historical center, impressive Livonian Order castle and St. John' s Lutheran Church. Cycle from the guest house to Cirulisi. Walk the Cirulisi trail (2,7-4,6 km), picturesque trail along Gauja River Valley. Canoeing from Cesis to Ligatne (~17 km, 4-5 h) which is one of the picturesque parts of the river Gauja where sand stone banks are visible. Cycling at the Ligatne Nature Park (5,1 km, 100% tarmac). Walking trails at Ligatne (5,5 km) is excellent to watch local wild animals and enjoy the river Gauja valley. Cycle from the Nature park to the guest house (~4- 9 km, 100 % tarmac). Cycling: Ligatne – Nurmizi - Sigulda (~30 km, 40% gravel road, 60% tarmac). Visit Peter's cave, Satezeles castle hill, Kraukļu cliff and Paradise hill with excellent views to the Gauja river valley. Cycling: Sigulda – Turaida – Krimulda - Sigulda (~30 km, forest trails, gravel road and tarmac) en route can visit Sigulda castle ruins, Gutmana cave , Turaida Museum Reserve, with the castle museum, observation tower, history museum and sculpture garden, the palace with the park of Krimulda, the Bob-sleigh track. Take a train from Sigulda to Riga. In the evening return bicycles at the hotel' s reception. Additional: transfer to the Riga Airport. 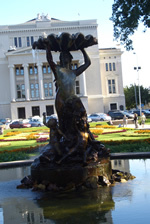 Individual departure or extra days in Riga or in the countryside in Latvia. *Minimum number of persons travelling - 2. *A price of the tour can change in case the planned guest houses/hotels are fully booked and we have to choose other accommodation sites. *Prices may change due to changes in national tax legislation or other independent reasons. Luggage trasport from hotel to hotel from day 2 to day 7: from 310.00 EUR/ 1-4 Pers. Cycling helmets 2 EUR per day/ pers.